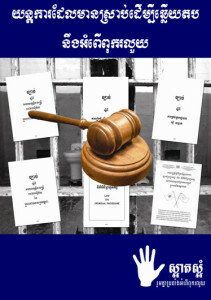 Corruption has been strongly embedded in Cambodian society under the current ruling party, the CPP. Observers noticed that “the longer CPP ruled Cambodia, the longer corruption pandemic contagious within this society.” With this perspective, many civilized countries have changed the leaders as well as displaced the top officials to ensure they can cut off the creation of patronage system. But in Cambodia, the cells and patronage of corruption have been never lessened. The cells and patronage systems have been relentlessly increased for its political leadership of “crony capitalism” or “modern autocratic” or “clientele-patron system”. Listening the Corruption Policy addressed by H.E.Yem Punnarith from the CNRP, the core mechanism to tackle corruption have been expounded and clarified concrete solution. For instance, to halt the corruption among public servants unless the government increase their salary at the level of living standard as well as be able to compete with the goods inflation. To halt the corruption among the elites and the powerful, the independent court as well as the independent unit of corruption body must be established etc. Further to above concrete solution, the political will with tangible policy has been addressed as the representative repeatedly affirmed on the strengthening the rule of law and the good governance if CNRP won the election. The speaker eloquently pointed key points of cause and effect of corruption. Speaker might have not enough time to mention on the importance of change the leader as well as to displace the key positions in the government in a regular basic as part of a concrete mechanism to tackle corruption top-down or vertical line, not horizontal ground. For the ruling party who has controlled the country for more than two decades and the status quo is their key political maneuver to be cared has repeatedly theorized that corruption is existing in everywhere in every country in which it is part of the greed of human behavior, but for the new democratic movement and humanism they have relentlessly addressed the issue as unacceptable and search all methodology to handle with this social virus (corruption). Let go to vote altogether all Khmer compatriots on 28 July 2013! Watching another parties addressing their economy policy for another 1 hour and 8 minutes make me a little bit exhausted but give me some sight on leadership existing within those small political parties. Of course, I am primarily intending to keep discerning only two prominent rival parties: Cambodia National Rescue Party and Cambodian People’s Party. First candidate is from Funcipec Party, the representative described keenly on key issues to develop economy. The written paper is extensive and attractive. However, I don’t see other parties have mainly focused on economy policy. Those representatives keenly addressed the whole theme of the party which sometime might be not in the focus on the question of “Economy Policy” if the party won the election. Some representative(s) boringly read the paper in which can distract the electorates who are closely following the policy of each party for their final decision-making. 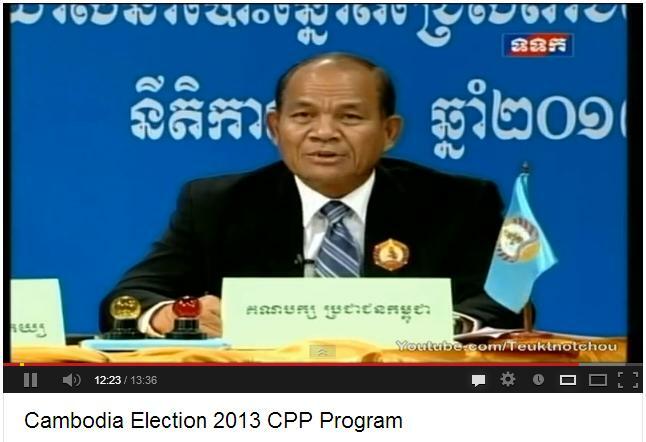 All Khmer compatriots please go to the poll to caste your vote this 28 July 2013 collectively. 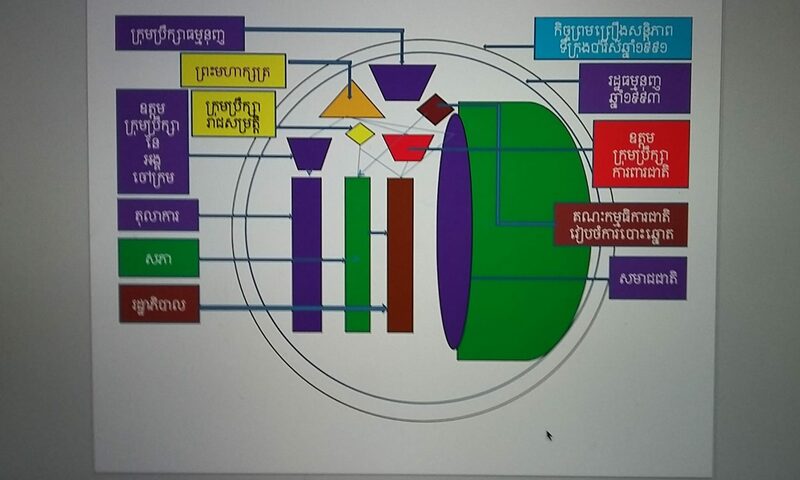 After watching the economy policy of the CPP addressed by H.E.Ouk Rabun who is the permanent member of the Cambodian People’s Party (CPP), the address is detailed, clear and well organized. The policy written in the paper is sliced into pieces regarding economy plans if the CPP won election. Of course, if one has anticipated the CPP which is the ruling party since 1997, the policy in each election has not changed much. This election mandate, the CPP has publicly announced that they will carry out the old policy but new implementation approach. The address in this time, the policy is attractive and achievable, but audience has placed doubts on its political will and concrete implementation. Lesson learned from previous elections, the similar policy has been publicly addressed but after the CPP won, there have been grossly unproductive to what party promised. There are some progress within the policy, but there are many flaws and violations over the policy such as the land concession, the forest management, the non-transparency of mineral and natural resources bidding, the corruption unit which is not independent and neutral in handling with corrupted officials, the widening gap of people’s living standard, the inability to collect national revenue especially tax to use for national development, the inability to pay back debts, the craving for more foreign loan without worrying the future adversity of this country and many more. In contradict to inclusive growth and equity economic development, the CPP has successfully built its strong political patronage for future strength of political power. 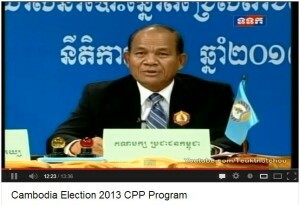 While maintaining the political status quo has been well aware among the ruling elites of the CPP, the unfair games in each election have been plentifully produced by the CPP although those games are not abiding by the National Constitution, the Democratic Principles and those games were extremely criticized by the foreign observers. Thus, I appreciate the paper work of this policy and hope the CPP can implement it accordingly if they won the election. Let stay tune to hear other party’s economy policy. Don’t forget to caste your vote on July 28, 2013. 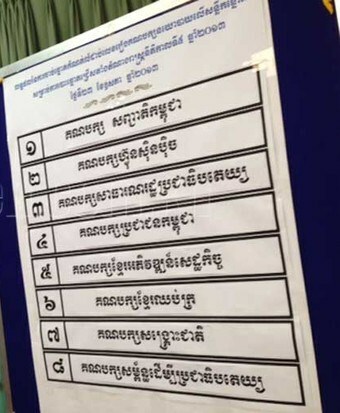 Election campaign kicked off in Cambodia on June 27, 2013 in the meantime Cambodia National Election Committee (NEC) released the list name of the candidates competing in each constituency. Eventually, the list name is not included Sam Rainsy who is a prominent leader of the opposition party. 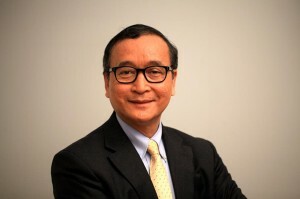 Sam Rainsy is a self-exiled politician in French to avoid 12 years jail of court conviction in Cambodia in which the observers claimed it is politically motivated. The absence of Sam Rainsy in the election this time has placed a critical question on the “legitimacy” on the election if the Cambodian Poeple’s Party (CPP) won. Democratic election in Cambodia was firstly organized by the United Nations Transitional Authority for Cambodia (UNTAC) in 1993 after the Paris Peace Accord was created to settle down the conflict and develop democracy in this country. But the legacy of UNTAC has been remarkably obstructed by the coup detat in 1997 when second prime minister Hun Sen was able to claim his single premiership. Since then, the national election has been totally monitored by the government which has never been able to separate itself from the ruling party CPP at all. During each national election such as in 1998, 2003, 2008 and this upcoming 2013, the ruling party has enjoyed free ride on consolidating all means to win the election. Like Cambodia Daily reported on June 29, 2013 that “Hun Sen has bolstered his political strength through a combination of electoral victories, influence over the broadcast media and judiciary, legal and extra-legal political maneuvers, intimidation of opponents, patronage, and economic threats,”. At the present, the merge of the opposition parties ie the Sam Rainsy Party and the Human Rights Party has established a new challenge to the ruling party CPP to merely predict their winning result. 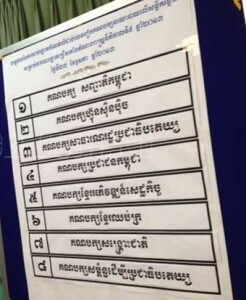 Thus, the trumping up charges towards to the opponent such as expelling the 27 opposition legislators from the National Assembly and cutting off their salary as well as the recent order to close all broadcasting media opposing their party, is considered an extra unfair election game worse than previous elections.